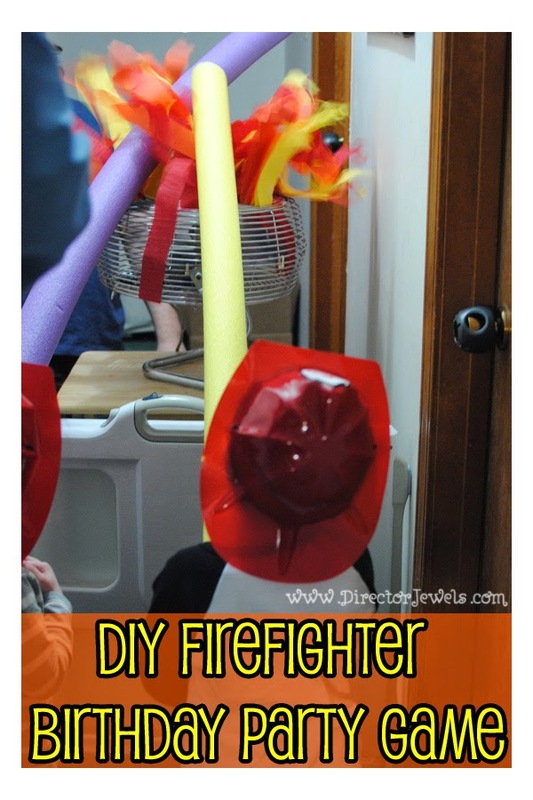 When I was planning Lincoln's firetruck birthday party, I knew I wanted to find some sort of activity to do with the kids. Planning a party for preschoolers is easy in some regards - they like everything - but difficult if you want to have any structured activity. I considered coloring sheets or crafts, but I can barely get Lincoln to focus on activities that require sitting down when we're having craft time one-on-one. With the excitement of having friends and family here for his party, there was no way he was going to be thrilled about having to sit and do a craft. So, on a whim, this Firefighter Game came to my mind. I was actually planning to just use it as a decoration, but I thought the kids would have a blast "putting out a fire" at the party - and it turns out I was right. Here's how to make your own! -Large Box Fan. Mine swivels so it can point upward, and that was perfect, but you could make it work with a stand-up box fan, too. 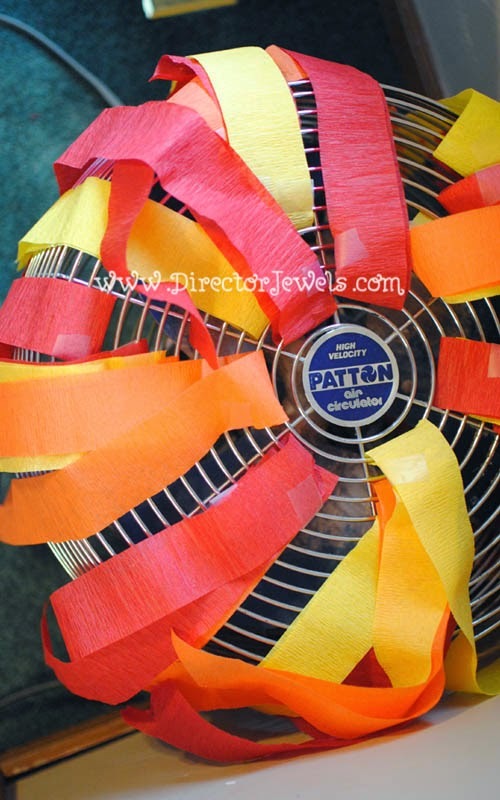 -Fire-colored Crepe Paper. I used red, orange, and yellow. 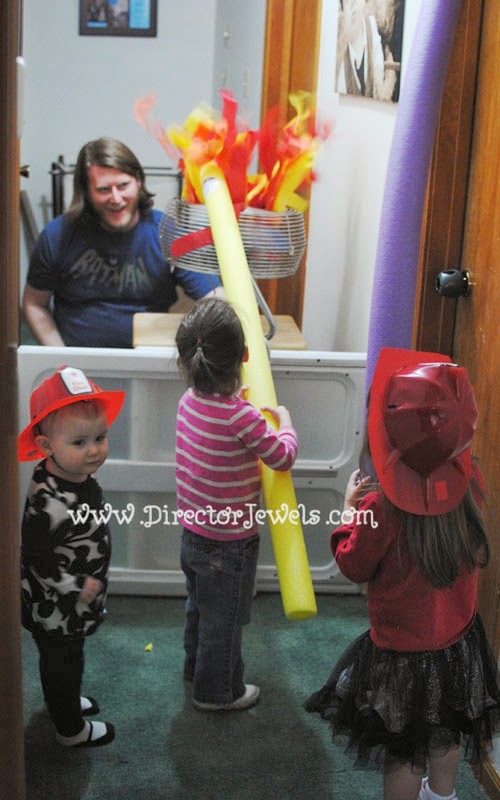 -One or Two Pool Noodles (these are the "fire hoses"). 1. 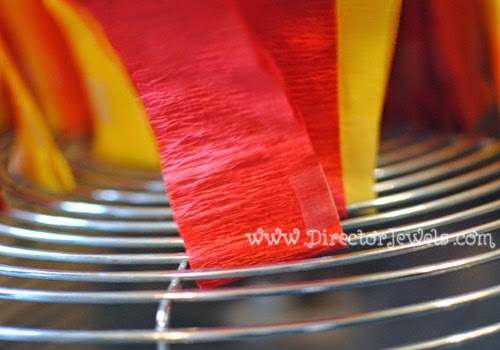 Cut strips of crepe paper. Mine ended up being around 12-18" long. If you're using multiple colors, make sure you have a roughly equal amount of each color. 2. 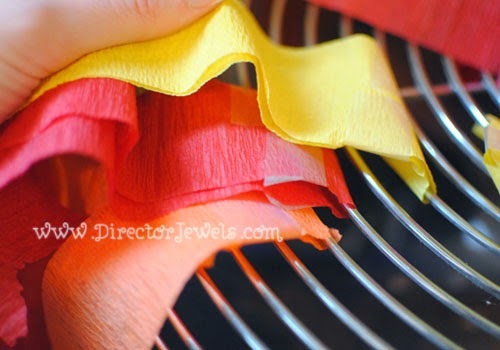 Use tweezers to thread piece of crepe paper through the fan. 3. Use tape to hold at least one side together near the paper fold (shown above). If you don't tape them, they'll just blow out when the fan is turned on. 4. 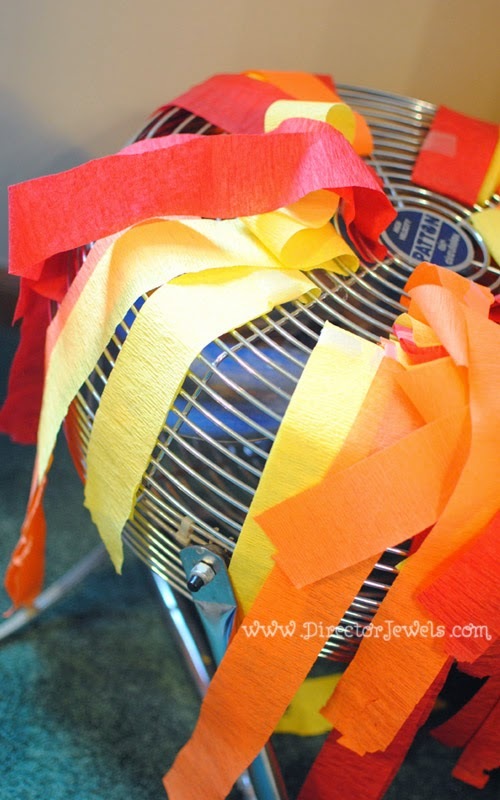 Test your fan's speeds to see which setting makes the best fire. On mine, it's Medium. You may have to encourage the pieces to stand up once the fan starts turning; sometimes they get stuck around the edges. That's it! It's so simple. Once you've constructed your fan, take a few minutes to plan your setup for the game. We ended up setting it on a TV tray behind a gate in our hallway, near an electrical outlet. 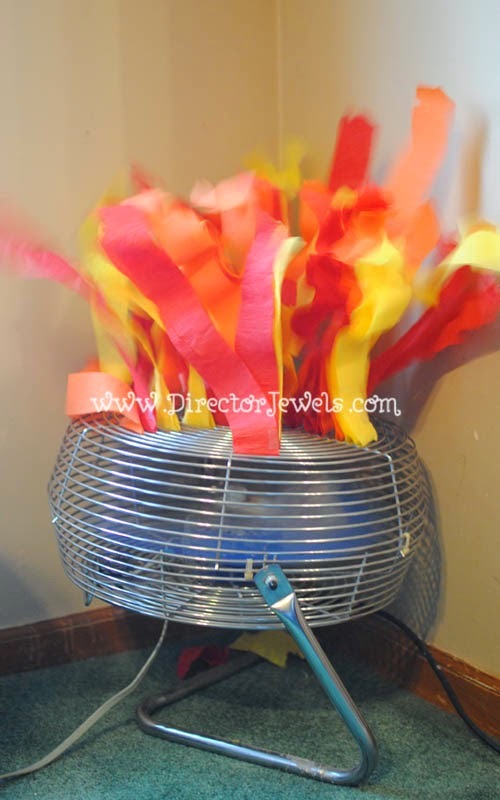 This kept the moving fan blades out of reach of the littlest hands and gave all of the kids a boundary. How to Play: Assign an adult to be in charge of the fire (plugging the fan into a power strip with an on/off switch is probably the easiest method). 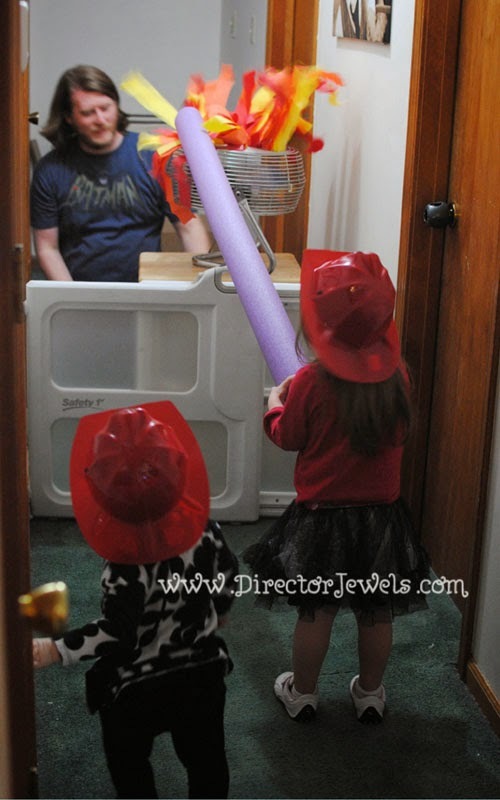 Line up the kids and let them take turns with the pool noodle hoses to "put out the fire." 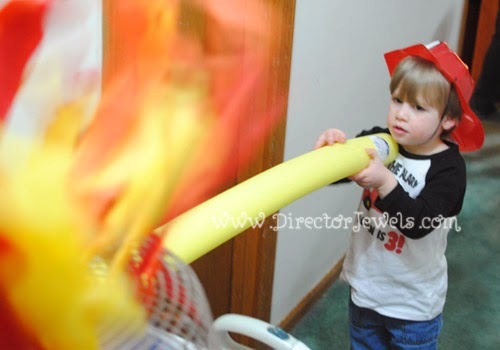 After a few seconds, the adult turns off the fan and the fire has been extinguished! Okay, so it sounds really silly. But the kids loved it. Several of them wanted to play over and over and over - and they had to be pulled away when it was time to eat cupcakes. It turns out that entertaining preschoolers is actually pretty easy. Lincoln has been asking to play the "fire game" for weeks. Definite birthday party success! 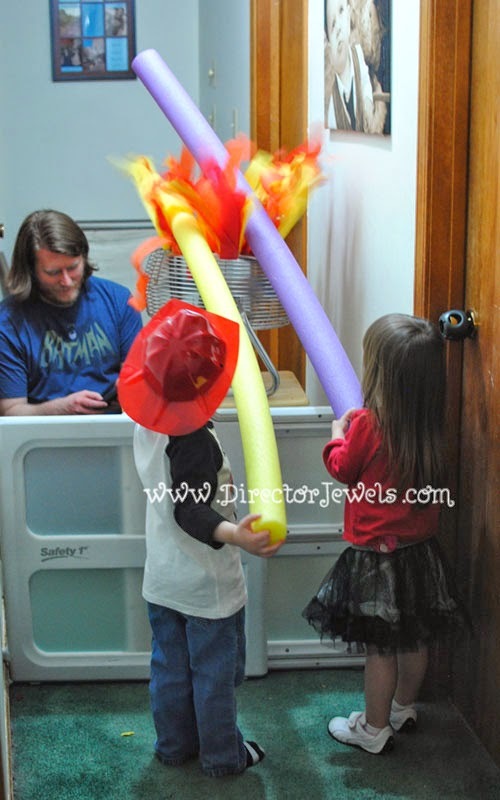 What's your favorite birthday party game? Great idea! How old were the kiddos?